I played the opening few hours of Batman: Arkham Knight in August. You know what I did after that? I opened up the map, saw that it was forested with icons, and then turned the game off forever. This has started happening quite frequently. Here are some huge games that I would love to have played, but did not manage to even touch over the past year or two: Pillars of Eternity, Shadow of Mordor, Assassin’s Creed Unity or Rogue, Wasteland 2, Dragon Age: Inquisition. Many more I played for somewhere between 10 and 30 hours and then had to move on from: Far Cry 4, Assassin’s Creed 4: Black Flag, Dark Souls 2 (and I’m such a big Souls fan that I’m literally writing the book on the original), Divinity: Original Sin. Meanwhile, this year, I’ve greatly enjoyed Bloodborne, Monster Hunter 4 Ultimate and The Witcher 3, all of which I’ve played for 50 hours or more. Come to think of it, I wouldn’t be surprised if I’d played Rocket League for 50 hours too. (That game is insidious. You don’t know you’re addicted until it’s much too late.) But half of them still aren’t completed, and meanwhile the Metal Gear Solid V disc languishes unplayed in my PS4 whilst other enormous games like Fallout 4, Assassin’s Creed Syndicate and Just Cause 3 sit just over the horizon. I know that I am far from the only person with this “problem” (I use the quote marks because seriously, in no world is having too many video games to play an actual problem, but it is a little concerning when it’s my job to know about them.) Keeping up with video games, even just the biggest ones, is becoming impossible for anyone with a job, a family, a social life or indeed other interests and passions. 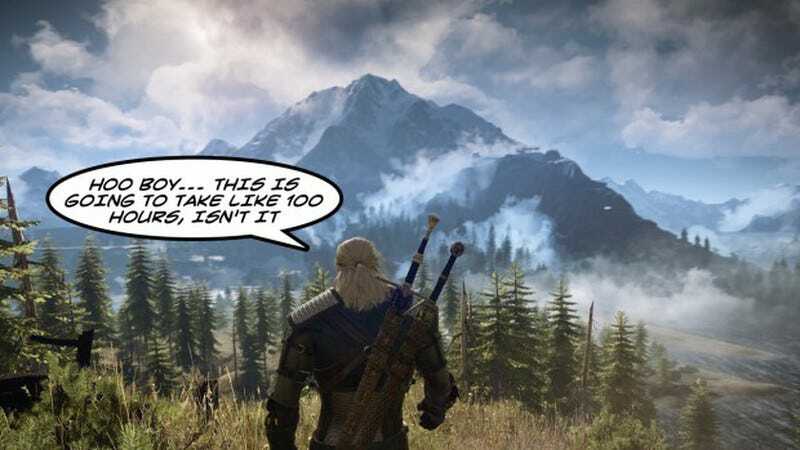 And it’s not just open-world games that have become extremely demanding of our time. The MMO-style rhythm and updates of games like Destiny and GTA Online means that you’re never really “done” with them; you just have to decide to stop. Then there are things like Elite: Dangerous, which are basically alternate lives at this point. Oh, and then there are the MOBAs. I ain’t even touched the MOBAs. I’ve seen what they’ve done to some of my friends. Welcome to Boston! You will not be leaving for probably 80 hours, so I hope you like it! Not every one of these games is worth so many hours. But this year especially, a great many of them are. I was actually quite relieved to learn that we won’t be seeing Persona 5 until next summer (in Japan at least, and probably not until the end of the year for Europe), because I really want to be able to devote proper time to it. What do you do when there are seven 50-hour-plus games out in a single year that you’re really, really keen to play? It’s been the case for quite some time that offering hours and hours of “content” is not enough to make a game worth playing. In a world with this many enormous games, the onus is on developers to make them worth all that time. I think this is a large part of what’s behind the pretty tepid critical reception of games like Mad Max and (to a lesser extent) Watch Dogs. When you’re presented with a game that needs that much time from you, especially if you’re a critic who has to play the whole thing (or certainly most of it) before being able to offer a considered verdict, you quickly start to resent it if it wastes your time. The only solution I can see is just to stop worrying about it. Everyone over about the age of 25 grew up in a world where you could feasibly play all of the worthwhile games that came out in a year, but that’s not the case anymore and hasn’t been for a while. As the audience for video games as a whole continues to grow, more and more of those people are not generalists, but specialists: people who play maybe one or two games predominantly, but might spend hundreds of hours on them nonetheless. Some ruthlessness is in order: instead of thinking “what am I getting for my money?”, I think “what am I getting for my time?”. So, I want to know: how do you cope? Does it bother you that there’s a pile of unplayed games sitting beneath your TV? Have you become more selective, or narrowed your gaming taste? And if you do manage to play all these enormous games, how the hell do you manage it?